Belmont are primed for a big finale to the outdoor bowls season! The Belfast side are bang on course for a double dose of glory after claiming a place in the final of the Irish Bowling Association’s Senior Cup final at the weekend. They just had too much in the locker for battling Cookstown and will now meet Private Greens League rivals Ballymena in the showcase decider on August 27. But before that big day, Belmont will be hoping to secure back-to-back PGL title wins. They currently enjoy a seven-and-a-half points lead over Dunbarton at the top, having completed 14 games. Ballymena are still in the equation as they trail the Gilford team by four points, but have played one game less. “It looks like it will be a hectic end to the season,” claimed Belmont’s Davy Hamilton. “There are only about four league games left, so it will be a tight finish. “It’s nice to be back in the IBA Cup final again. We haven’t won the trophy for quite a while, but we’ll be taking nothing for granted. " Stuart Bennett was Belmont’s top performer, skipping his rink to a 22-16 win against Liam McHugh. The the other skips were not far behind with Roy Battersby, Simon Martin and Robin Horner claiming victories against Sean Quinn (19-15), Mark Wilson (24-17) and Damien McElroy (21-17). Meanwhile, Ballymena have a double cup final date to look forward to in a fortnight. They were just too good for Portrush at Ballymoney at the weekend, which sets up that all-PGL showdown with Belmont. But just 48 hours before that, Ballymena will face Dunbarton in the final of the PGL Senior Cup. It could get even better for the boys from the Braid because they are still very much in contention at the top of the PGL Division One table, although Belmont remain favourites to retain the title. Jim Baker was in inspirational form in his team’s 78-62 win against Portrush, skipping his rink to a 19-11 win against Simon Colvin. Andy Duncan also claimed a significant 27-16 success against Gary McCloy. But the Provincial side failed to toss in the towel and his back through Jackie Smyth and Ian McClure, who defeated Nigen T Robinson (19-17) and Stephen Coleman (18-15). Results: IBA Senior Cup semi finals: Portrush 62 Ballymena 78, Belmont 84 Cookstown 65. IBA Intermediate Cup semi finals: Shaftesbury 68 Ards 96, Bessbrook 71 Belmont C 73. NIBA Division One: Dundonald 72 (2) Banbridge 80 (5), Donaghadee 70 (1) Whitehead 89 (6), Lisnagarvey 102 (5) Domore 74 (2), Bangor 103 (5.5) Portadown 59 (1.5), Divis (2) Balmoral (5). NIBA Division Two: Carrickfergus 85 (5) Dunannon 73 (2), Newtownabbey 63 (1) Castle 83 (6), Whitehead B 75 (1) Londonderry Park 88 (6), Markethill 83 (6) Lurgan 81 (1). NIBA Division Three: Portadown B 77 (2) St Stephen’s 85 (5), Rathfriland 46 (0) Ormeau 97 (7), Balmoral 69 (0) Carrickfergus B 96 (7), Clarendon 102 (6) Musgrave 70 (0). NIBA Division Four: Annalong 77 (5) Newcastle 73 (2), Finaghy 121 (7) Cloughey 43 (0), Lurgan B 58 (1) Ulster Maple Leaf 87 (6), North Down 72 (2) Holywood75 (5), Warrenpoint 93 (6) Lisnagarvey B 70 (1). NIBA Division Five: Windsor 86 (7) Newry 64 (1), Gilnahirk 81 (5) Lagan Valley 67 (2). NIBA Division Six: Castle B 72 (5) Castleton 62 (2), Glengormley 66 (2) Rathfriland B 71 (5), 9th Old Boys 48 (1) Musgrave 87 (6), Curran B 89 (6) McQuiston Memorial 77 (1). NIPGL Division One: NICS 68 (1) Dunbarton 102 (6), Mossley 80 (0) Larne 91 (7). NIPGL Division Two: Willowfield 76 (2), Salisbury 77 (5), Ballymena B 96 (7) Cliftonville 59 (0), Falls 97 (5.5) Forth River 64 (1.5). 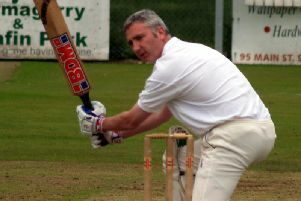 NIPGL Division Three: Cavvehill 69 (0) Comber 89 (7), Saintfield 72 (1) Pickie B 84 (6), Shorts 61 (1.5) Knock 70.25 (5.5). NIPGL Division Four: Ards B 71 (0) Ewarts B 95 (7). NIPGL Division Five: Albert Foundry 105 (6) Cavehill B 60 (1).